Hello and welcome to the start of codeofaninja.com's series of web development articles! Setting up a development environment for PHP programming is easy. Download the code editor you prefer, I personally like atom.io text editor. Next is to install XAMPP, the most popular PHP development environment. This package contains Apache, PHP & MariaDB or MySQL database applications. Many people emailed me with a main question: Mike, how to run a PHP script? This post is my answer to you guys and to those people who will need this in the future. In the following tutorial, we will learn how to install XAMPP, how to run a PHP script, manage database with PhpMyAdmin and run a sample PHP script that fetches a record from the database. Go to this link and download XAMPP for your operating system. XAMPP is available for Windows, Linux or Mac. Here's a video about how you can install and use XAMPP. The following is an example about how to run a PHP script. What this program does is show a "Hello World!" text on the screen or webpage. I'm using Windows, so my root server directory is "C:\xampp\htdocs\". 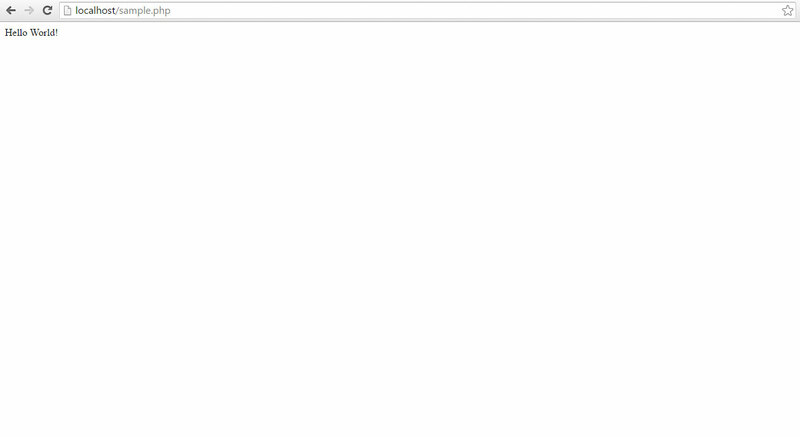 Create a file and name it "hello.php"
Open hello.php and put the following code. Great job, you just run a PHP script! MySQL is an open-source relational database management system (RDBMS). MySQL is a popular choice of database for use in web applications. phpMyAdmin is a free and open source tool written in PHP intended to handle the administration of MySQL with the use of a web browser. 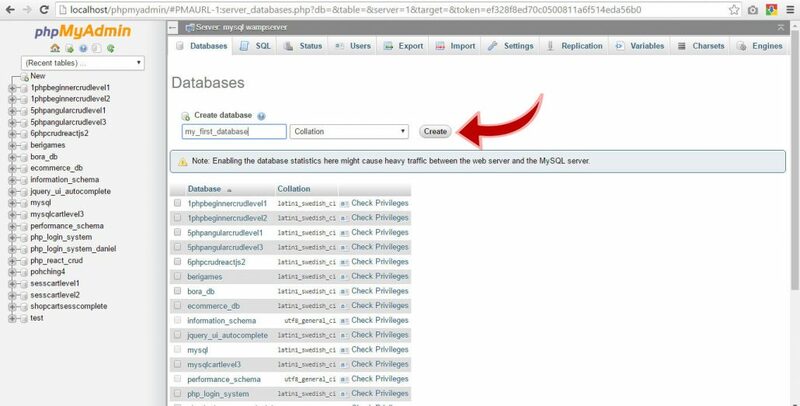 In the following examples, we will see how easy we can handle MySQL with PhpMyAdmin. 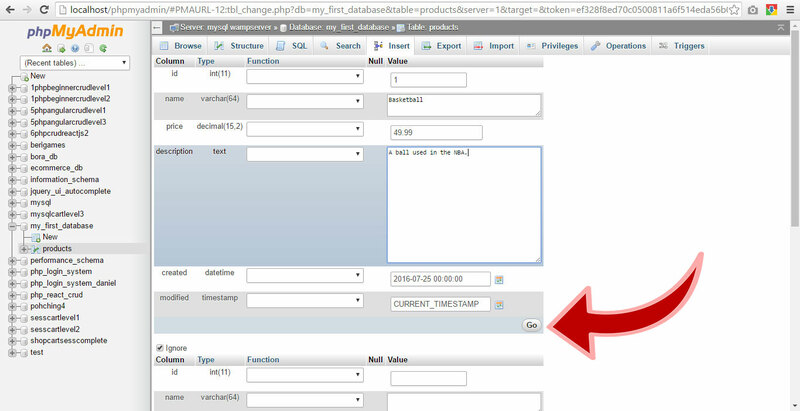 Fill out the "Database Name" field with "my_first_database". On the "Create Table" section, fill out the Name with "products" and Number of Columns with "6"
Fill out the fields with id, name, etc. Fill out the form, mimic the data on the following image. Click the "Go" button. Great job! 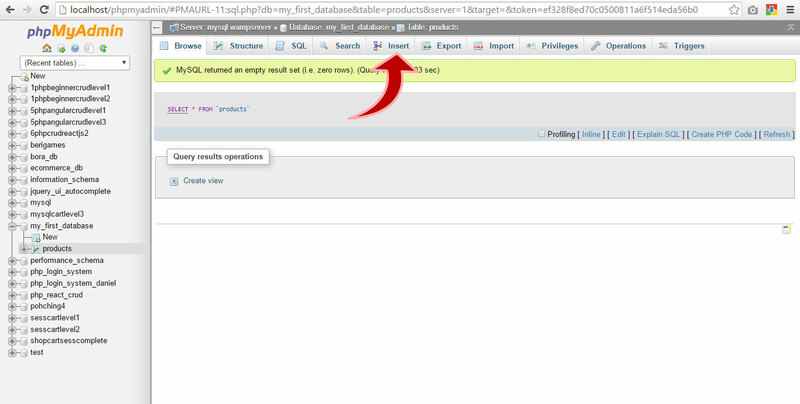 We now have a database, a table inside the database and a record inside the table. 1. 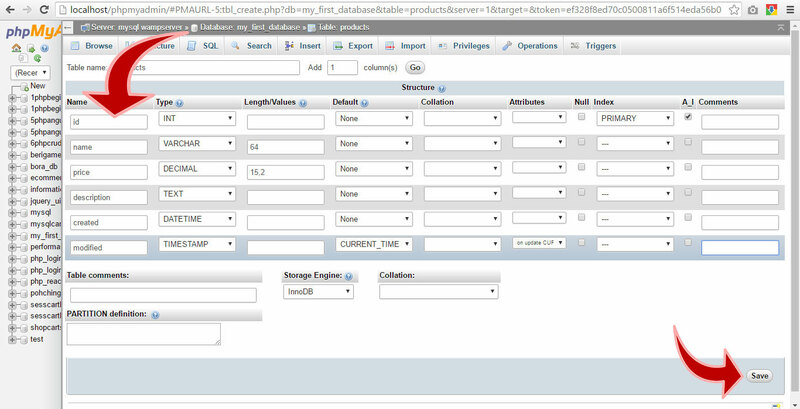 Create a database and import MySQL file. 2. 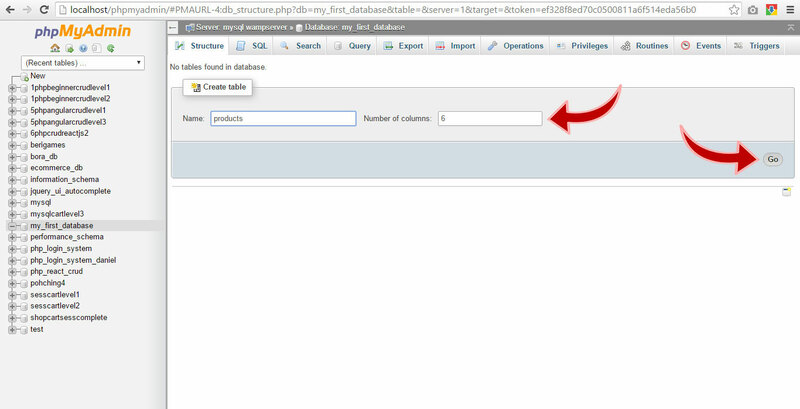 Create a database and create table. 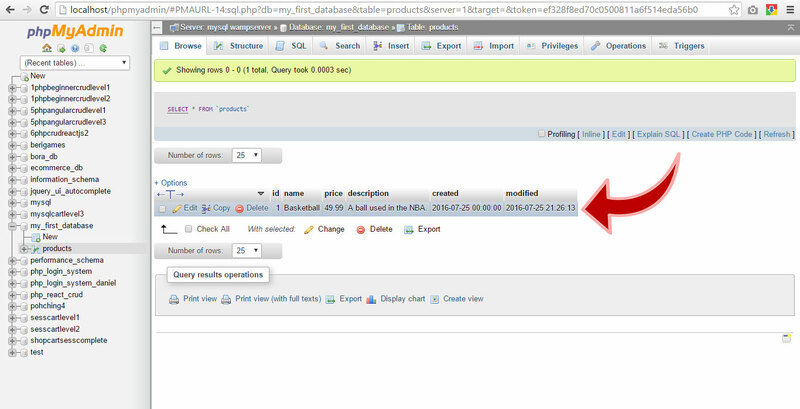 In the following steps, we will run a PHP script that fetches one record from the MySQL database. Create a file and name it "read_one.php"
The numbers 1-8 in the following code are called "code comments". It explains each part of our simple code below. Open read_one.php and put the following code. Awesome! You are now ready to learn more about web programming and development. Here in codeofaninja.com, we want to simplify learning for you to actually build something. But it is also important for you to read and study more. The following are my suggestions where to learn more. PHP Manual - official PHP documentation. PHP The Right Way - easy-to-read, quick reference for PHP popular coding standards and more. PHP Delusions - proper use of PHP programming language, proper use, with the focus on disproving various delusions and superstitions. PHP Cheat Sheets - Variable comparison, arithmetic and testing cheat sheet. PHP Security Cheat Sheets - prevent attacks like XSS, SQL Injection and more. Cross-Site Scripting Attacks (XSS) - Another good resource to learn cross-site scripting (XSS) and prevent it. You can always go back to the list above while you go along our series of web programming tutorials. 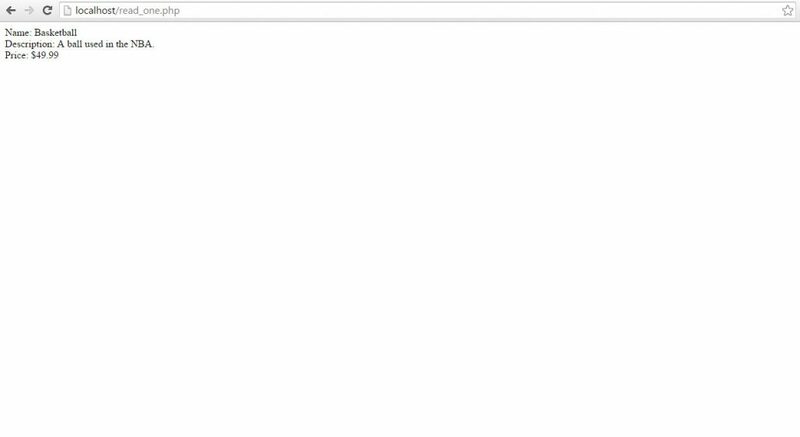 Today we have learned how to run a PHP script. Before we learn more of PHP & MySQL programming, let us learn how to use a front-end framework that will beautify the user-interface of simple applications that we will build. 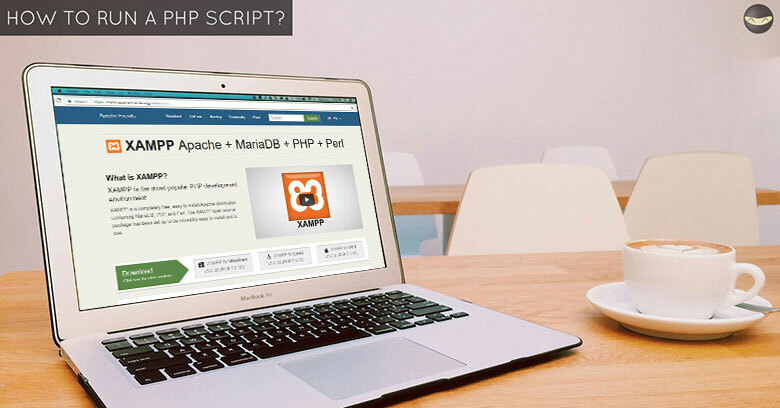 Please share this post if you think this is a useful tutorial about how to run a PHP script. Thanks for learning here in codeofaninja.com!